The back seating area features some lovely British West Indies style furniture which is crafted from beautiful dark wood (hardwoods like teak and mahogany were often used to prevent warping in the high humidity). I still have plenty of inspiring images to share from my visit to Blairsden, The Mansion in May. 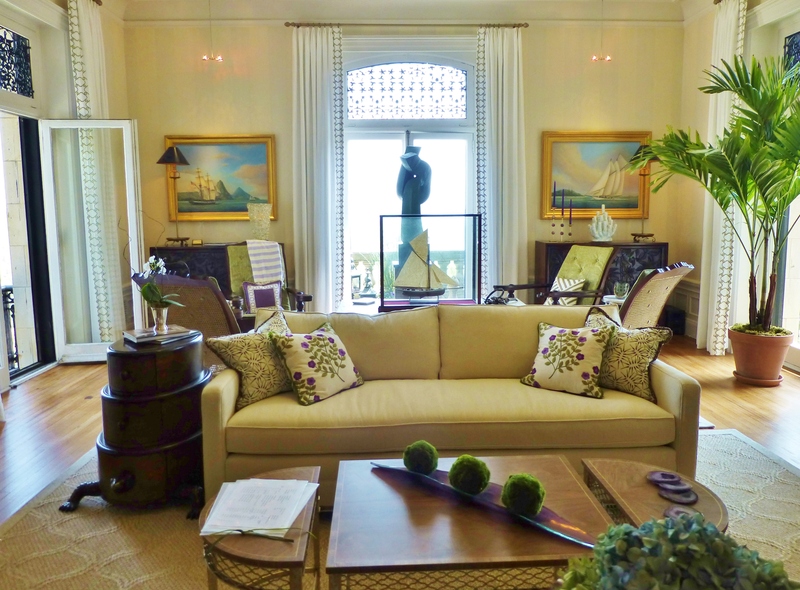 Today’s installment will feature my photos of a lovely living room designed by Curren Design Associates, Inc.
Michael L. Curren designed a Charleston-inspired living room on the 2nd floor of the mansion. 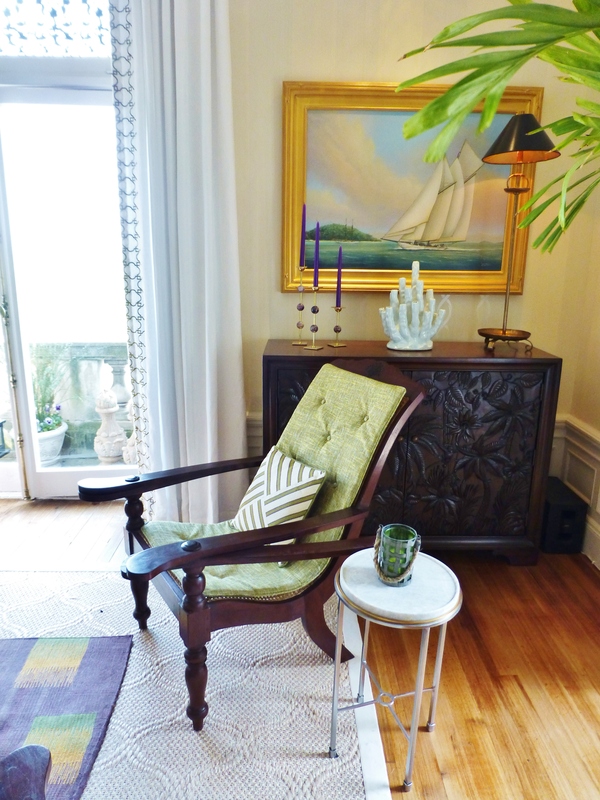 He included transitional furnishings and contemporary artwork, combined with British West Indies items, to represent the mélange of many cultures found in Charleston, South Carolina. Upon entering the large living room, you are welcomed by a neutral transitional sofa with colorful embroidered pillows. Notice the purple and green accents found throughout the room! The extra tall windows are treated to simple white drapery panels with an embellished leading edge. The space is divided into two different living areas. The main area is centered around the fireplace. 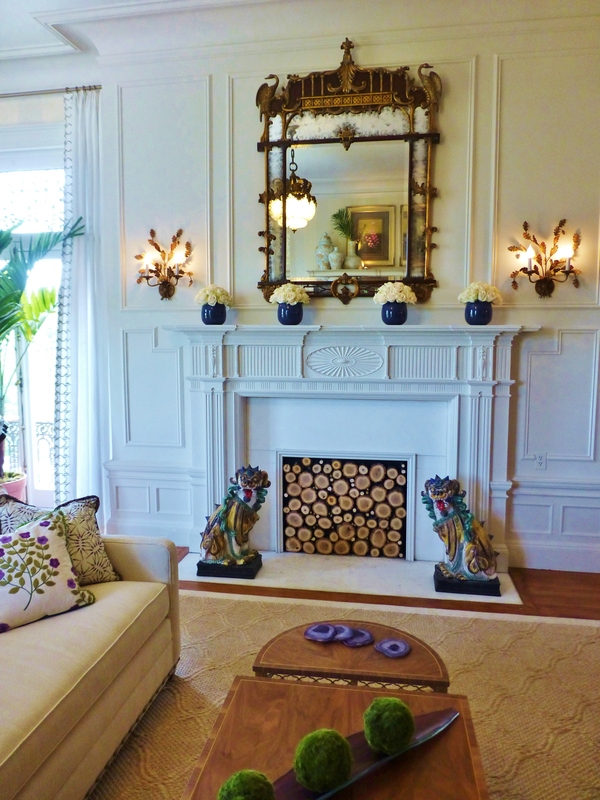 The beautiful original fireplace is topped by a stunning Chippendale mirror and the hearth is flanked by colorful Foo Dogs. I love how the designer filled the opening with stacked logs (so textural)! 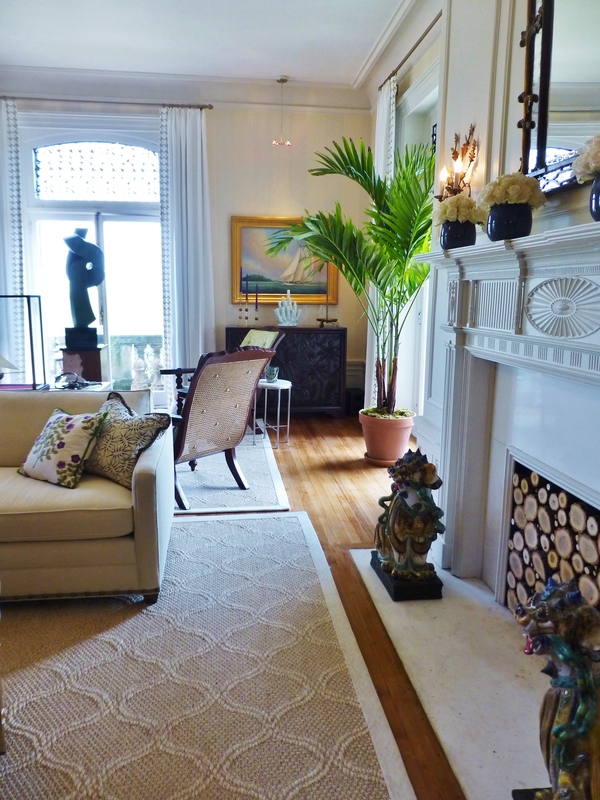 In this image, you can see that two woven sisal area rugs were used to define the separate seating areas. I also appreciate how the sculpture is placed in the window, its dark profile is even more beautiful when outlined in the sun. The back seating area features some lovely British West Indies style furniture which is crafted from beautiful dark wood (hardwoods like teak and mahogany were often used to prevent warping in the high humidity). These specific ‘Plantation or Planter’s Chairs’ were designed with arms that swivel out to support swollen legs (so the plantation owner could remove his high boots). Such a cool piece of furniture, isn’t it? 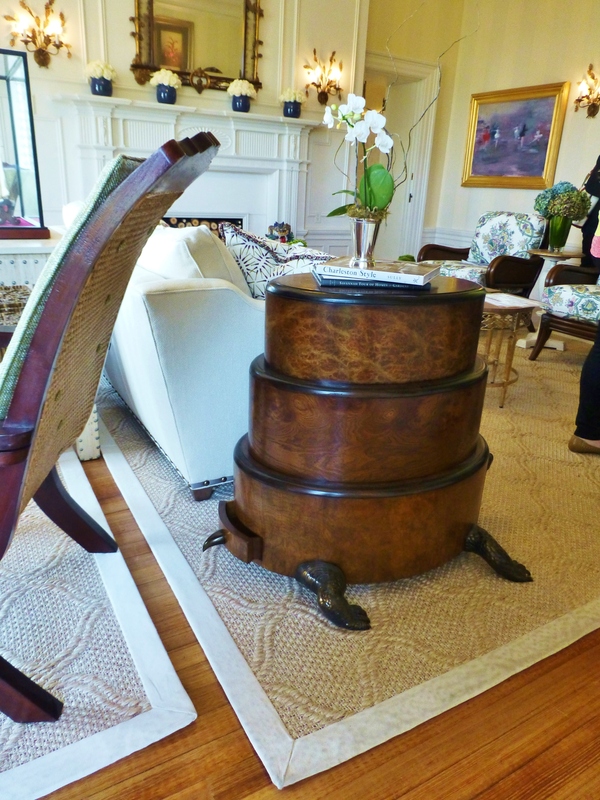 At one end of the sofa is this amazing Turtle Table. I just LOVE this! 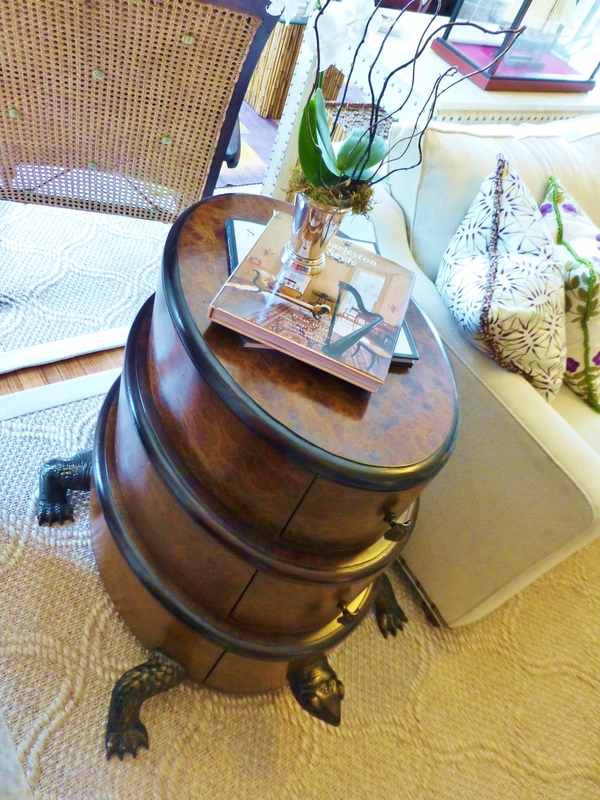 The table is comprised of three stacked oval drawer sections, with bronze tail, feet, and head. Here’s another view of the Turtle Table. Isn’t is adorable? I’ll leave you with this parting, tilted image. This photo was an accident, but I really liked the way it showed the colors and textures that were present in this room. The color combinations were bold (green and purple), but the designer presented them in a very subtle fashion. Thanks for visiting, once again. I hope you’re enjoying our tour of Blairsden, the 2014 Mansion in May. Until next time, tell everyone you know about Kristine Robinson’s blog. Feel free to pin these images on Pinterest, or share on Facebook. 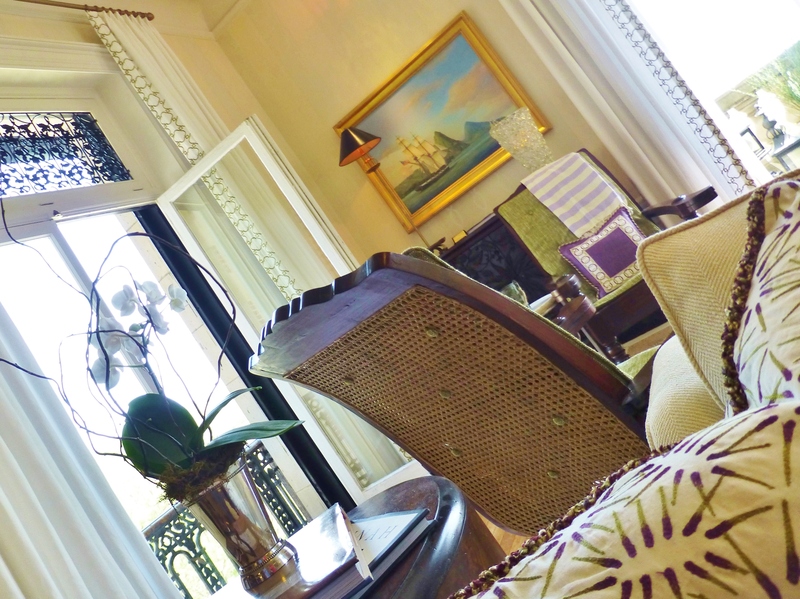 This entry was posted in Decorating, Furniture, Home Decor, Interior Design & Decorating and tagged British West Indies, Charleston, Color Schemes, Decor, Fabric, Interior Designer, Living Room, Mansion in May, Plantation Chair, Purple, Robinson interiors, Windows. Bookmark the permalink.